NCTech4Good, an affiliate of NTEN and TechSoup’s NetSquared, is the local resource for nonprofit technology information. Join the sharing and networking at monthly meetings on the third Wednesday of the month, 6:30-8:30 pm, usually at UNC-TV, and our annual conference, http://www.nct4g.org/. Check out our generous sponsors. Meet the core leadership team. 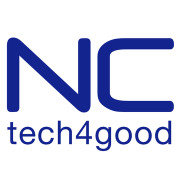 Follow us on Facebook and Twitter @nctech4good, and with the hashtag #nct4g. NCTech4Good Policies. History of NCTech4Good.